When someone in the “DIY” community wants to machine their own bushings for a project nylon is usually chosen as the material. This is because nylon is well-known and people trust it as a bearing material. But nylon isn’t optimal for all applications and sometimes can have serious drawbacks. It has poor impact properties, cannot handle extreme cold (where it gets even more brittle), and swells in water. This means that nylon is a poor choice for aquatic environments. Polyurethane is a better choice particularly Redco 750 XL. 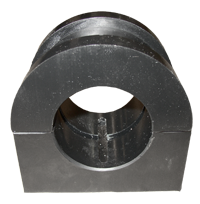 This product is a black, lubrication-impregnated, bearing-grade polyurethane. Were you aware polyurethane came in bearing grades? Most people only think of it as a foam or a soft analogous product similar to rubber. In fact, polyurethane preforms very well as a bearing and requires little maintenance or lubrication. In most other respects the bearing is similar to nylon, though it can only handle 2500 PSI (compared to nylon’s 4000 PSI rating). Still, for most DIY applications that level of load should be fine. Bearing grade polyurethane is available in standard 18″ lengths and in diameters from 2″-6″. This does preclude it from being used in smaller bushings, where extruded nylon 6/6 or acetal may be necessary.